When Jeremy Lin first started playing with the Knicks, every time he entered Madison Square Garden, security personnel would ask him if he was a trainer. I guess they didn't have a lot of Asian guys coming through those halls. That, of course, was before Linsanity. There was crazy anticipation going into the game. How would New York welcome Jeremy wearing a Rockets jersey? How would Jeremy, who's been struggling on and off this season, fare against his former teammates? How would the Rockets stack up this time around against the Knicks, who were undefeated in the Garden this season? The Knicks got smoked, as the Rockets handed them their season's first home loss. And Jeremy! 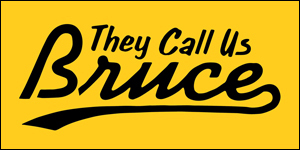 Dude was 9-for-15, with 22 points, eight assists, four rebounds, two steals and four turnovers in 39 minutes. I know the guy is humble, and I love him for it, but that had to feel pretty darn good. Applause all around. Let's keep it going, Jeremy. 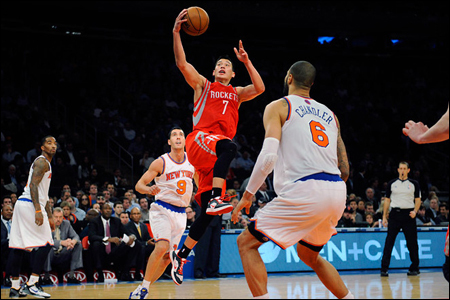 More here: Jeremy Lin stars in return to Madison Square Garden as Rockets rout Knicks. UPDATE: And some good words from Grantland's Hua Hsu, who went to last night's game: We Went There: Linsanity Returns to the Garden.